China does not seek to change the existing status of territorial claims in the South China Sea with its newly built lighthouses, the Foreign Ministry said on Tuesday, arguing that Beijing already had "indisputable sovereignty" in the contested waters. China says its lighthouses on Cuarteron Reef and Johnson South Reef in the Spratly islands will assist navigational security, but experts and diplomats call them a shrewd move to buttress Beijing's territorial claims. China claims most of the energy-rich waters of the South China Sea, through which about $5 trillion in shipborne trade passes every year. 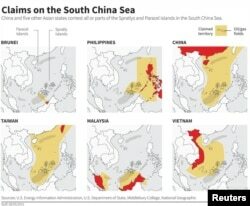 But neighbors Brunei, Malaysia, the Philippines, Taiwan, and Vietnam also have overlapping claims. On Monday, the Philippines' foreign ministry said the lighthouses were "obviously intended to change actual conditions" and that Manila would not accept China's "unilateral actions as a fait accompli." China's Foreign Ministry spokeswoman Hua Chunying defended the structures as "completely within China's sovereignty" and said they had no relation to "some people's" comments that China was trying to bolster its hold over the islands. "I want to stress that China has indisputable sovereignty over the Nansha islands and surrounding waters," Hua said, using the Chinese name for the Spratlys. "We absolutely do not need to build lighthouses to strengthen our sovereignty claims." She added, "There is no issue of changing the status quo." The United States, which has criticized China's building on artificial islands, has said it would sail or fly wherever international law allows. While the U.S. and other navies mostly rely on electronic instruments to confirm their ships' positions, visual fixes from lighthouses are still used in certain conditions. References to the lighthouses are likely to find their way into international shipping charts and registers and the logbooks of foreign navies. Experts say that could help China to build a long-term legal picture of effective occupation, despite any formal diplomatic objections of rival claimants.